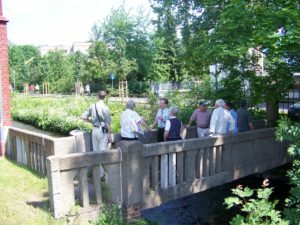 Dietrich reminisce’s about his youth when he would walk across this bridge on his way to school and he would meet Mr. Sauer coming the other way on his journey to the Plant office. 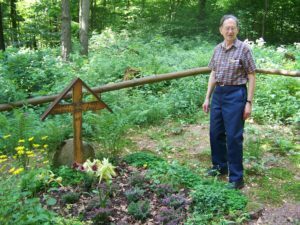 At a monument in the woods where two German youth were killed during the War. As the American troops were approaching Suhl the German officers ordered the Hitler Youth to report to the front. Two tried to avoid doing that and were executed on this spot by the SS. 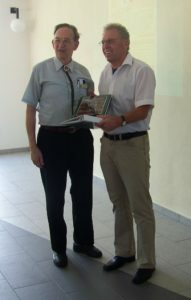 Dietrich was always promoting the GGCA by giving Journals or books to prominant individuals. Dietrich with a product of the Jaeger Arms Co., Jenkintown, Pa.
I’m Jim Cate, author of the SAUER books and a friend of Dietrich’s. I had already written two books about J.P.Sauer’s pistols and the Company history that went along with these pistols before I ever came in contact with Dietrich. 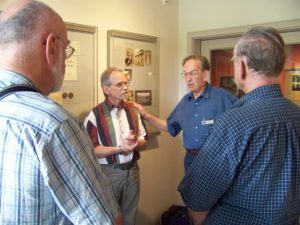 After he found out that I had written two books about the pistols of the original Sauer Company in Suhl he asked me to be a founding member of the German Gun Collectors Association, and I did so. 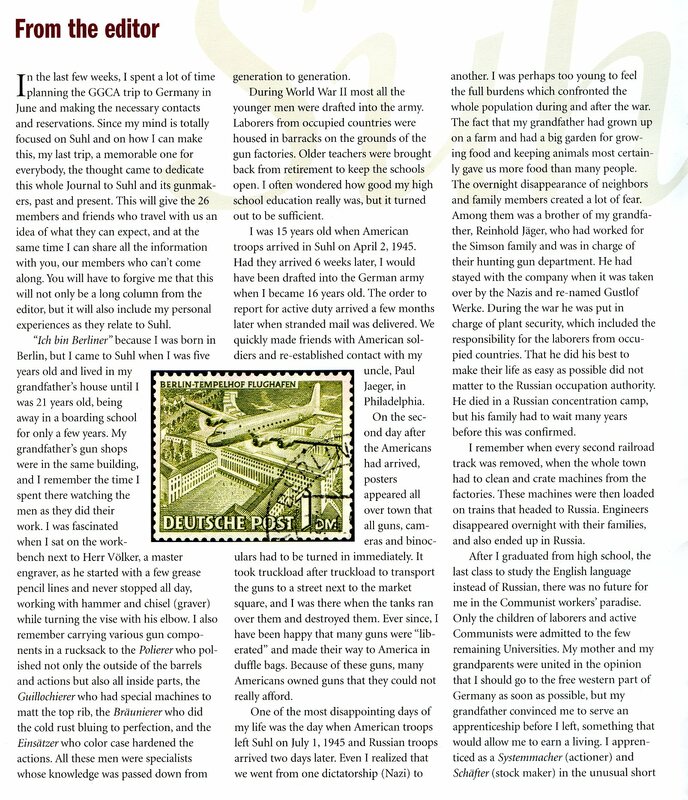 It was not long after that he discussed the idea with me of my writing another book about Sauer’s hunting and sporting guns made before the Russians took control of Suhl in July, 1945. I emphasized to him that the “Long” guns were not my forte, but he continued to encourage me to consider writing a new book about the hunting/sporting guns. I had very little documentation on the long guns and had not done any research regarding them during the numerous trips I made to Suhl. I was the first American to visit the Archive after the “Wall” came down. I was in Suhl in early Spring after the wall came down in November of 1989. All of the old Sauer facilities were still standing. After many consultations and learning sessions with Sauer collectors, and more trips to dig out Sauer information found in the Suhl Archive, I began the process of ‘making the book.’ During the entire process Dietrich continued to encourage me to include as much information and excellent photos as possible. I relied on many GGCA members for excellent photos, serial numbers, descriptions, historical data, etc.. 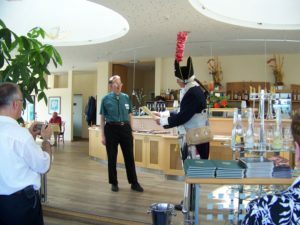 Eight years ago, after more than six years in the ‘making’ , I had the new Sauer book published and I began selling them to members and non-members in many differant countries. About 50% of the new books were sold directly to individuals, with the remaining being sold to the GGCA and book dealers here and in Europe. I received several excellent book reviews and lots of compliments, but I truly believe Dietrich was just as happy as I was that the book was a success. He visited our home here in Chattanooga before the book was completed. He was a very determined person who created the GGCA and had strong feelings about it’s success. So much so that he (I was told later) upset several members who wanted to change numerous aspects of the organization supposedly to make it better. I stayed away from being a board member, although Dietrich wanted me to be one, in order that I could concentrate on completing the new book. 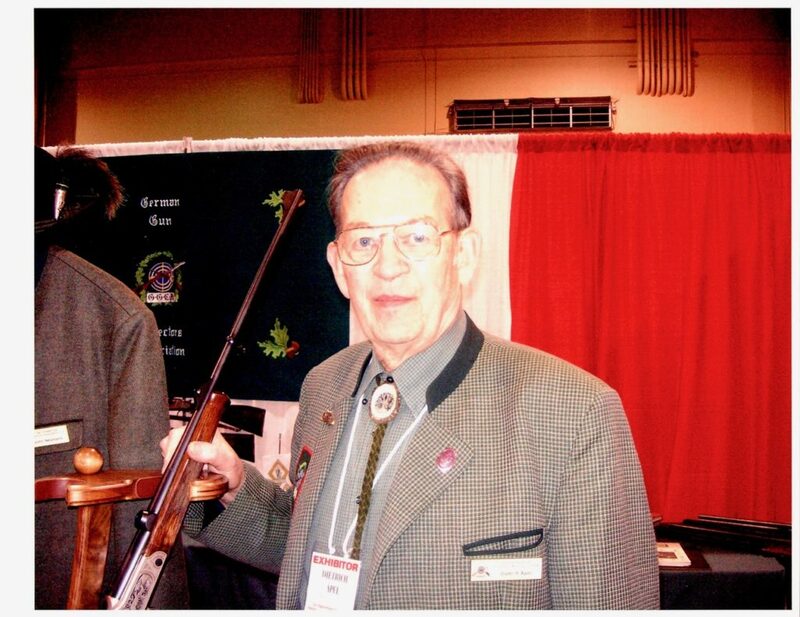 He continued to forward many inquiries to me even after he left the GGCA so I could answer questions about Sauer guns. I will always consider him a good friend and a trusted adviser. remember Dietrich and keep him in my memory. I got to know Dietrich personally for the first time in 1982 and since then, I have always felt the greatest respect and admiration for the strong but modest man he was. 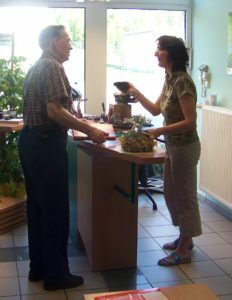 What started out as a mere business relationship turned into a very good and personal friendship over the years. 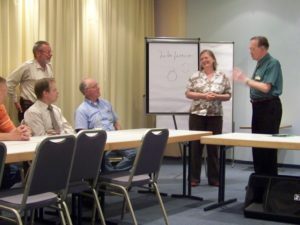 During the many hours we got to spend together at trade fairs and later in his house in New Hampshire, a picture of a hard working man grew in my head. 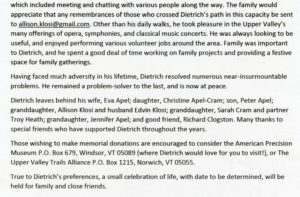 Dietrich was always living under the pressure of utmost economy and with great thoughtfulness in business as well as private matters. 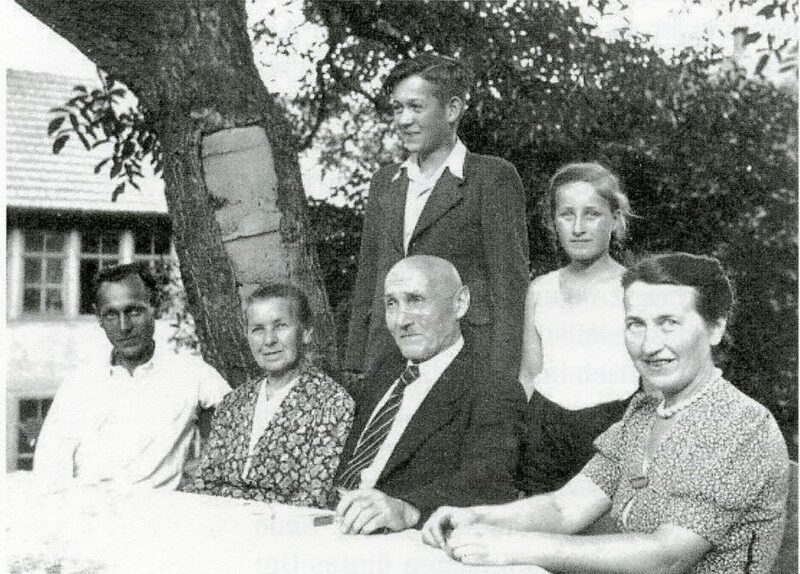 Influenced and shaped by the consequences of the Second World War and the disastrous Nazi regime which affected his own family, his struggle continued in the confrontation with his uncle after his emigration to the USA. We met shortly before he sold shares of the firm Jaeger to the owners of Dunn’s. I am sure that the time in tennessee was one of the biggest disappointments and the most bitter experience of his life. But how powerfull he continued: In two years after he had left Dunn’s he built his house with a workshop in New hampshire by hand. After a short interlude at LEICA, we founded Schmidt & Bender Inc. USA on his recommendation at the beginning of 1993. Many years of great success to the benefit of both sides followed. 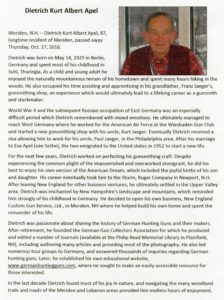 Dietrich had a life long passion for ensuring the sustained importance of German hunting weapons and their producers on the U. S. market. This eventually resulted in the foundation of the German Gun Collecting Association, which he promoted and guided with great enthusiasm. This way, he set himself a great monument that will continue to live on way past his lifetime. I am sure that true fans of noble and beautiful hunting weapons on both sides of the Atlantic will appreciate this for many more years to come. The most important thing for me to remember about my relationship with Dietrich is, however, that he was a fatherly friend to me. In all those years, he always gave good and well considered advice based on his personal life experience. He was there to help me out generously whenever I faced difficult circumstances. In this sense, I will forever remember Dietrich and keep him in my memory. 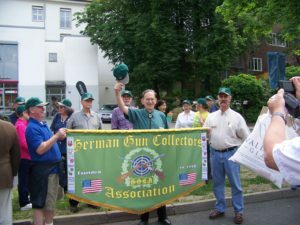 In the mid 1990’s I read in the magazine Shooting Sportsman that Dietrich Apel in New Hampshire was contemplating starting a German Gun Collectors Association. The notice stated that he was inviting people who shared that interest to join his effort. I immediately responded and joined the Association as Charter Member no. 171. I had always had an interest in German Guns and Culture and bemoaned the fact that there was very little written about them in America. 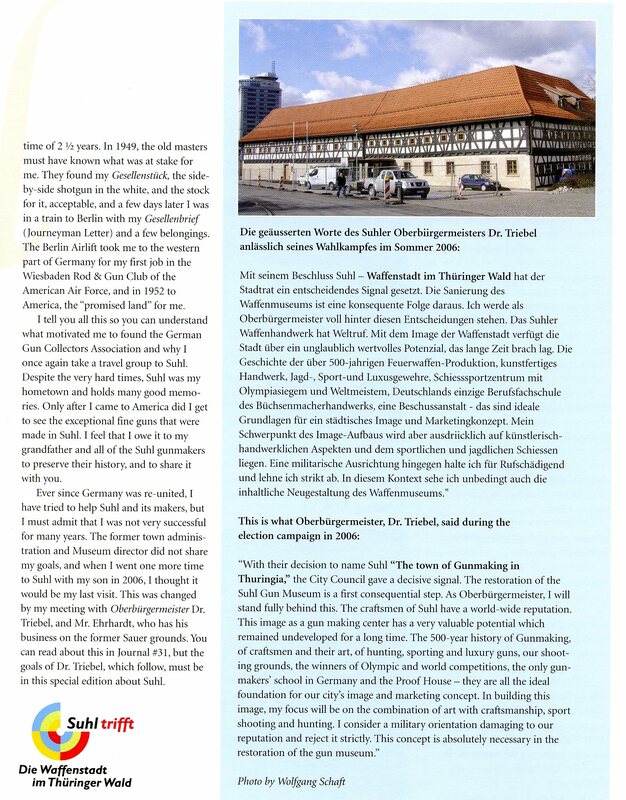 Dietrich lead the first tour to Germany in 1999 and afterwards when I read about it in the Association Journal I vowed that if there was another tour I wanted to go on it. So it was that in 2000 I had plans to fly to Frankfort and meet the tour group on a Monday morning before the group got under way. After boarding a plane in Buffalo, N.Y. on Sunday morning I flew to New York City to board the Trans-Atlantic flight. Before take off the crew found a faulty door latch which grounded the plane until it could be fixed. It was over five hours later that the plane finally took off. I had no way to contact Dietrich to tell him of my delay so I just sat back and figured once I got to Frankfort I would ask for help to get to the first nights accommodations. Dietrich and the tour group waited for me at the appointed time at the Airport but when I did not arrive Dietrich called my wife to find out where I was. She told him she had put me on the plane the day before, and had no knowledge of my delay, but was able to give him my flight number. 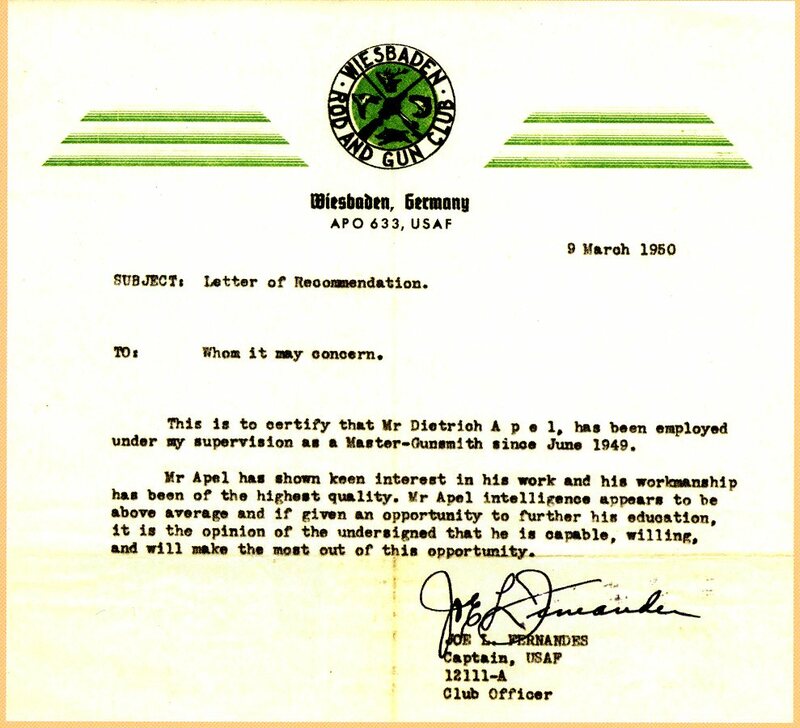 From that information he was able to find out that the flight would be arriving later so the tour proceeded without Dietrich. Unbeknownst to me Dietrich waited at the Airport until my flight arrived in the mid afternoon. When I arrived and cleared Customs, I approached the crowd of people at the arrival gate and there in front waiting was Dietrich. He had no idea what I looked like or how he would find me but I recognized him from pictures of him in the Journal. I approached him and introduced myself and we were both greatly relieved. It was truly a Stanley meeting Livingston moment. We had no time to waste on pleasentries if we were to catch up to the tour. Dietrich immediately led me to the baggage pickup where we loaded my cases on a cart which he immediately started pushing through the Airport. From there we boarded a train, the first of two, then onto a bus. During all of this Dietrich toted my heavy suit case while he left me with the light one. When we got off of the bus we had about a half mile hike up a street (up hill) to get to the Schmidt-Bender plant where we hoped to meet the tour group. I was so tired that everything seemed a blur but Dietrich seemed to take it all in stride. At the age of 71 he impressed me with his Stamina. When we arrived at the evenings accommadations Dietrich took me aside and insisted that I call my wife to let her know that I had arrived safely. He made the assurance to Bonnie that I had arrived safely a priority and true to his nature nothing would deter him until I made the call. That night I thanked the Lord for Dietrich and what he had done for me. On that tour and the 2008 tour that I also attended I always felt safe and well looked after under Dietrich’s watchful eye. That was the start of our friendship and in the following years he enriched my life in more ways than I can begin to describe. 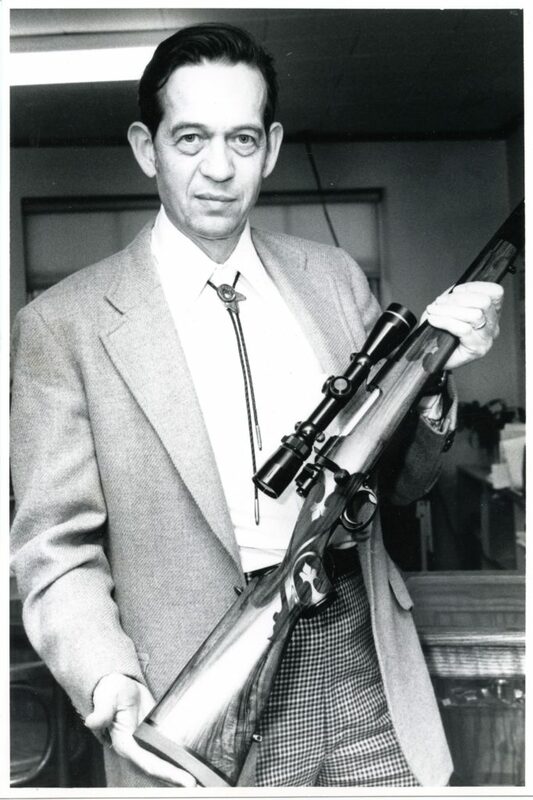 I now continue the web site that he started and maintain his mission to educate people about the great German sporting guns and their makers. I invite anyone reading this to send me information they have and I will add it to the site.